This is an easy craft for smaller children to do for the 9th commandment of the Ten Commandments. "Thou Shalt Not Lie" or "Thou Shalt Not Bear False Witness Against Thy Neighbor". Have the kids color a black line all around the rim of the paper plate. Then have them draw a black circle in the middle. Have them draw a line through middle going sideways and write the words, "LIES" in the middle of the paper plate. Have them color some of the paper plate red like the picture shows. Write the words, "Exodus 20:16 on the paper plate in the middle in small letters. 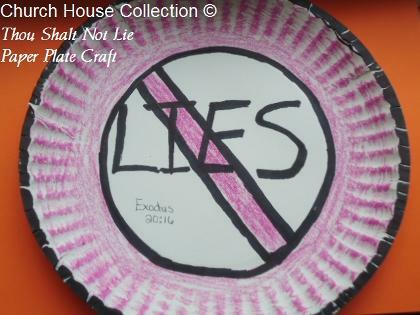 This craft goes with our matching lesson plan, "Thou Shalt Not Lie Sunday School Lesson". Use this easy craft when teaching on the Ten Commandments. We have all Ten Commandments broken down into lesson plans. They come with matching materials. Try our Ten Commandments Bible Matching Game.